Over the Christmas and New Year period my wife and I a few weeks over in Canada. Much of that was up in Whistler but we ended the trip with 3-4 days in Vancouver. Below are some of my observations relevant to what we discuss here. I’m mindful that some of these may be impacted by the time of year and also simply not knowing the city as locals would. Downtown Vancouver is one of the densest areas in North America. The area is dotted with a huge number of skyscrapers and is home to about twice the number of people as Auckland’s City Centre, in a similar size footprint. Yet despite this, I found the streets strangely quiet. Whereas Auckland’s city centre is focused in and around Queen St where there are a huge number of people walking daily, I never really felt that busyness on Vancouver’s streets. The only place that felt busy like that downtown was at the Pacific Centre, a large mostly underground mall that’s also connected to both skytrain lines. Even if there was some level of people volume on a street, it felt like you could just walk a block and it would all change, and visa versa. In other words, lots of little sporadic patches of activity but it never felt consistent. Interestingly we often found the same thing with restaurants and cafe’s, there would be some around but they’d look empty (and an empty cafe isn’t a great sign), and when we found one that looked decent, it would have an 1.5 hour wait. While on the topic of density, Vancouver is famous for its podium apartment towers, where there’s a low-rise podium at street level but with a tall, slender tower on top of that. This is to both help break the density up and to allow more light though to the street level. What’s not often mentioned in this is also the role street trees play. 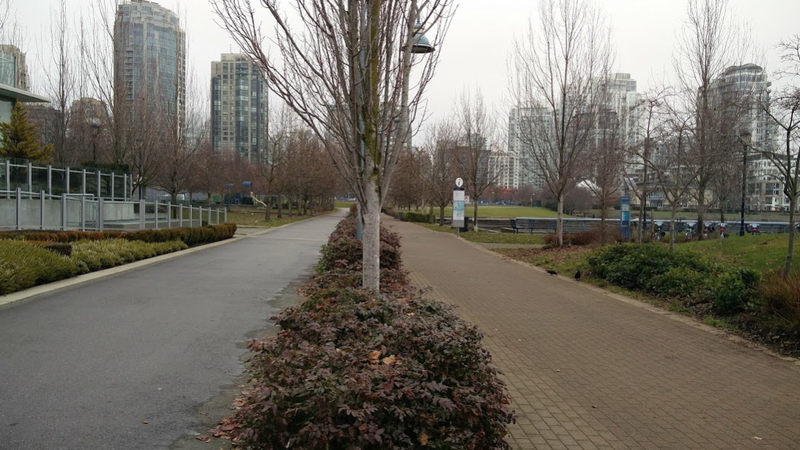 They’re not everywhere but street trees seem to be much more common in Vancouver and in many places are further used to break up the bulk of buildings, like below. The other aspect about this I noticed is that there were a number of service lanes. Auckland is following cities like Melbourne in re-purposing many of those lanes for more urban space, e.g. Fort Lane, however, this isn’t a think in Vancouver. My guess is much of this can be put down to the lack of intensity I felt. Walking around most of Auckland you often feel like a second class citizen. Traffic lights have strictly regimented phases with normally only a short window for pedestrians in order to accommodate every conceivable vehicle movement. It’s not uncommon for the ‘don’t walk’ symbol will start flashing you’re only halfway across the road and at some intersections you can spend minutes and minutes waiting for your brief turn. By comparison, walking around downtown Vancouver was a breeze. As an example, after New Years celebrations we decided to walk back to our hotel, a wise decision it turned out given streets were jammed with cars. It was about a 2km back to our hotel, crossing though about 15 light controlled intersections, yet we only had to stop and wait to cross once, and it was only a short wait at that. We had similar experiences other times we walked around. The key reason it was so much easier than in Auckland was that the traffic signals and rules are designed to make walking easier. By default, traffic signals activate without having to press a beg button, something that only happens in Auckland at a handful of locations. What’s more, walking phases are activated in the same direction as traffic flow and for the same length of time as cars get. Turning cars can still do so but only if people aren’t crossing. Drivers seemed to be more polite and expecting of pedestrians and so it never felt unsafe. We need to make walking around Auckland, and not just the city centre, as easy as it is in Vancouver. Even in chilly temperatures, Vancouver is easy to ride a bike, and many were doing just that – I imagine bike numbers really boom in Summer. 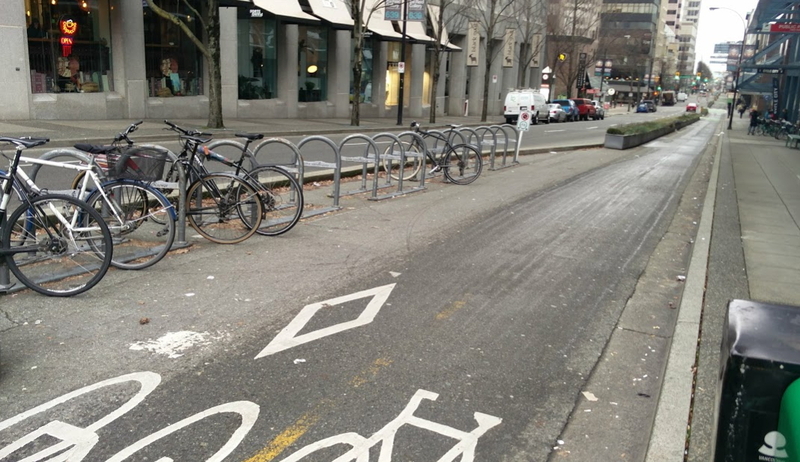 Its ridability comes thank to a number of bike lanes around the city and the Seawall. It also helps being relatively flat. Some of those bike lanes, like on Hornby St, are fantastic and part of the inspiration behind using planter boxes on Quay St.
One feature I really liked was that in some places, bike parking was incorporated into the protected bike lane design. Some of the other cycleway bays housed a bike share scheme. We took a tour by bike which was both informative and great fun. Much of it was along the seawall, a walking and biking path around much of the harbour edge. The quality of the path varies but much of it highlights exactly what Tamaki Dr should look like with physically separated and generous walking and cycling paths. There are also small features which I loved, such as that street signs on roads with bike infrastructure have a bike symbol on them. There was no way I was passing though Vancouver without using Skytrain at least once. With driverless trains helping to deliver fantastic frequency of a train every few minutes, it really is such an ideal system. It’s what any city starting to build rapid transit from scratch should be aiming for. We caught the expo line a couple of times and even with 6-car trains every few minutes they were fairly busy. That’s also borne out the stats as in the year to the end of October, there were almost 105 million trips on the Expo and Millennium lines. That’s about 15 million more than our entire PT network combined. Of course, we also used the Canada Line to get to the airport when it came time to leave. The Canada Line was built in 2009, in advance of the 2010 Winter games. The line is also very busy with now over 46 million trips on it annually, well ahead of predictions. Part of its busyness comes from it using quite small trains, they’re only 40m long across two carriages. As well as high frequencies, this suggests good all day usage. What did surprise me though is that there looks to be only limited ability to increase capacity in the future. Much of the route is underground and the stations don’t appear to be designed to allow for any expansion in the future. It did make me wonder if limiting that ability for future expansion is something the city will regret in a few decades time. One thing that did surprise me was that dwell times across both lines felt slow. The few times I checked, stops took around 35 seconds and almost all of that was sitting with the doors open – I still don’t understand why our doors are so slow to operate. Vancouver also has a great bus system carrying nearly 250 million trips annually. I didn’t ride a bus there so can’t comment on that aspect but I did notice that a lot of the buses are trolley buses and many are also articulated for extra capacity, allowing for much quicker and easier boarding and alighting than our double deckers. Overall, Vancouverites make almost 160 trips on PT per person per year, about 3 times what Aucklanders do. Vancouver today prides itself on the fact it never built any motorways though its downtown area. One was planned but was stopped by locals in the 60’s. However, many of the roads are still quite wide and designed to carry a lot of traffic. One thing that did surprise me about the streets was just how much parking there was. This was both off street parking buildings but even more so, the huge amount of on-street carparking, much more so than in Auckland. On the flip side, this is something that’s likely to present Vancouver with a huge opportunity in future years if they re-purpose it for other things, like more bike lanes. I think that’s enough for now. We had a great time in both Whistler and Vancouver, but it’s also nice to be back to some warmth. The complexity of the traffic light phasing in Auckland is so frustrating. Even as a driver waiting to get your special arrow can take an age, most of the time no traffic in the opposite direction blocking your way. Lovely city. Glad you enjoyed. Having also been there a few times I would point out that it has the grid pattern which makes it easier for those pedestrian signals especially when coupled with most streets being large enough to be if not arterial roads themselves (4 lanes etc). You don’t really need motorways when you have these everywhere providing multiple options. Also on the flat. The reason why a lot of the cafes and shops didn’t seem busy is that a lot of Vancouver has turned into a ghost town. It has become too expensive for the locals to own property there and a huge amount is owned by foreign nationals (mostly from one country I’m not allowed to name). As a result many apartments are left vacant and the cafes etc end up empty. The city has implemented a foreign buyer tax recently which has helped. Gold, dollars, bitcoin, homes. They’re merely various kinds of investments. It’s just unfortunate that people happen to need a home to live in. Do you actually have a citation which proves that there are empty homes and high levels of foreign investment? It’s my suspicion that this is happening in NZ and Vancouver, but there doesn’t seem to be any data. Good on you for deriding foreign ownership rather than complaining about a single country, btw. It wouldn’t matter if those condos were owned by Americans, Kuwaitis, or Chinese, the effect is still the same. We’ve got a census coming up in a couple of months, that will hopefully shed some light on unoccupied dwellings at least. A good article on Vancouver here, cites some actual studies too. It is quite sad its the victim of its own success. Vancouver is desirable to live so its houses are considered ‘gold’ and treat like speculative resource. I spend time in Vancouver multiple times per year for work and personal purposes. Christmas time is quiet there, so what was noted in the main article is really about people getting out of the city for family and/or vacation. Ski hills in BC become absolutely mad with people from (mainly) Vancouver amd Alberta, queues for lifts increase from typical 5 minutes or less during the rest of the season to half an hour or more. Foreign buyers tax has been minimally effective at best, more a political statement. It slowed the market for a few months. The reality is work arounds have been developed and real estate in Vancouver continues to rise, with knock-on impacts for many other cities in BC. Most articles on Auckland and Vancouver real estate issues read almost identically, to the point where I need to check which city I’m reading about. “”With driverless trains helping to deliver fantastic frequency of a train every few minutes, it really is such an ideal system. “” Reminds me of Lille. It makes sense; if you want people to use PT then it has to be frequent and fast. Then for an economic service you need driverless. What are the obstacles to driverless PT in Auckland? I can’t imagine the North Shore local buses being driverless in the near term but what about trains and the busways? Is it a matter of removing level crossings? What other factors? When driverless has issues the whole system goes down, no trains are running. This is no different to what’s happening with driver-operated trains in Auckland. Skytrains can also be controlled remotely, or by someone in the cabin with controls that pop out of a console. If there is a problem on the track they isolate that section and use a bus shuttle. Trains stop and start return journey at stations either side of trouble spot. Nice article – I haven’t been back since 2016, and lived in Whistler and Vancouver for about 6 years, but I feel that some of the ‘quietness’ you may have felt would be seasonal (as you pointed out) – many vancouverites may leave the city for the 2 weeks christmas holidays, and probably many joined you up in Whistler! I bet it was busy up there!!! Buses and trains there are so easy to use. My first day arriving in Vancouver I managed to use the skytrain, bus and ferry to get from the airport, to downtown, to Grouse Mountain. I’ve been living in Vancouver for 10 years + 5 days. About a year ago I emailed the blog twice to ask if there was any interest in me doing a series of guests posts about what it’s like here, since the city is known to be quite similar to Auckland in some areas. No one ever replied so I lost enthusasim for the time investment to do it properly. Too bad as I could have corrected some inaccuracies from this post and added additional info on subjects that you would have loved. We get a lot of spam offering guest posts and other stuff for the blog so it might have got caught up in that sorry. But what are the inaccuracies, most of it was just observations. No worries, it’s not something that is any trouble to me, I was just surprised at the time. Sorry for maybe making it sound like you got something drastically wrong with “inaccuracies”. More like I would have had some different perspectives on your observations, supplemented with other additional info. I was in Vancouver in November for 2 weeks and can’t say it resembled a ghostown at all. It was usually pretty busy on the streets everywhere I went most hours of the day and evening. Some areas were a little quiet but i wouldnt say it was any worse than Auckland, for example. So the quietness on the streets may be a seasonal thing, although it pretty much rained the whole time I was there anyway. Whereas I passed through the city for a day on the way to Rockies in mid-December and it I find it eerie how Matt’s descriptions in that paragraph matched my thoughts at the time. Possibly a combination of individual perspective and seasonal fluctuations. Vancovuer CBD is quiet (at times) because the zoning prevents residential in the business area. It’s downright dead after hours and the weekends as a result. Auckland is much better in this regard. Vancouver itself does fairly well, but it’s tied to Burnaby, Richmond and the North Shore and as such has a pervasive car culture that is as bad or worse than Auckland’s. You are not treated well as a cyclist. While they are finally making progress (such as the Evergreen line and at least talking about changing the 99 bus into a skytrain as well as LRT in Surrey), they are in a similar boat as here, with not enough money to do anything useful and the state government only interested in roads (and not spending money on anything). The Skytrains have become more and more unreliable as time has gone on, with things particularly bad when I was living there – investment has been in newer cars, but the underlying control system is literally decades old. 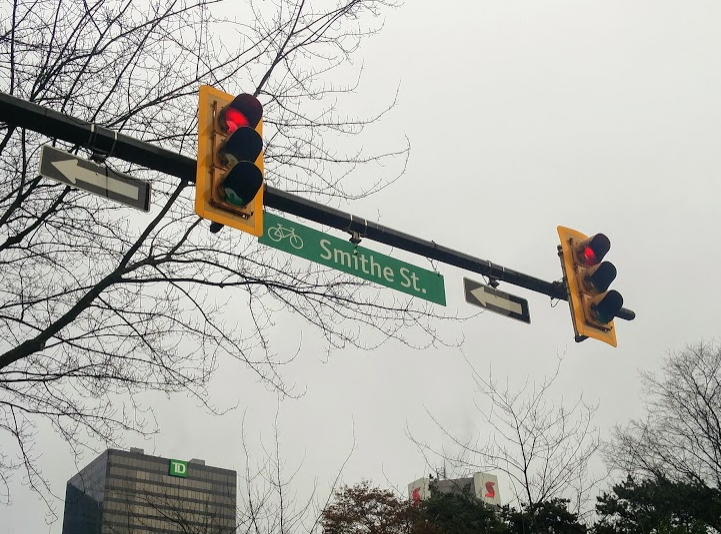 (Cycling) Culturally vancouver is very similar to Auckland – lots of sportswear, high vis, helmets etc, but I noticed much fewer MAMILs, so they at least were not clouding the waters when cycle lane design was considerd. I’ll be back in July so might do a photo essay especially on the Burrard Bridge intersection. Err… the BC state government is currently headed by the NDP with support from the Greens,??? I guess I’m a bit out of touch now 🙂 Not seeing a lot of change though. It’s quite sad to read partially informed comments. Broadway skytrain tunnel has been under design for some time, Liberal federal govt has promised funding so could theoritically proceed quite quickly, although business case still to do. People got bored of provincial Liberal arrogance (and conservatives are crazy) so NDP/Greens got in although last time they were in power they killed the economy. This time around first election promise was to remove tolls on new Port Mann bridge and instantly increase traffic 30%. Well done to them for that one. I have also been to Vancouver and their city planning is much better than auckland. Vancouver density is best of both worlds as the ‘node’ is very high density. Yet the residenal has a lot of suburban feel. 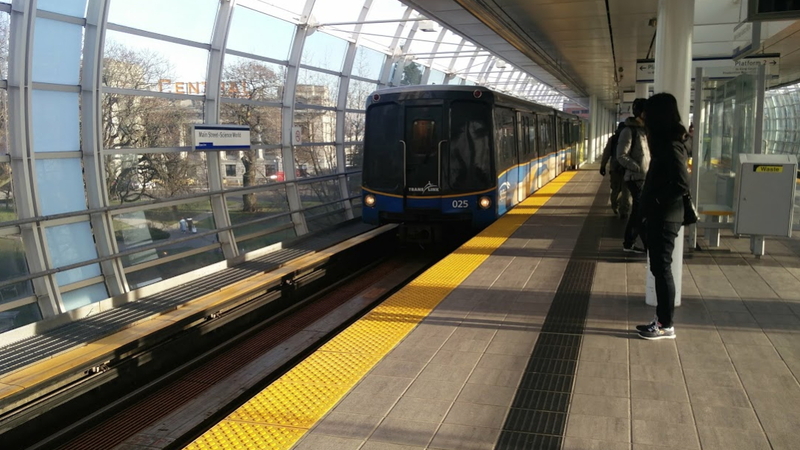 They have vibrant busy high density place such as downtown pacific centre, and also suburban TOD stations such as metrotown metropolis which is about 4x bigger and better than slyvia park, which most people use skytrain to go there. What make vancouver a interesting place is it also cater for suburban lifestyles, cycling and driving. The street are grid and the main road laid with shops and trolley bus transit, where the inside streets are where the detached house located. The house are land efficient taking small footprint without huge unnecessary backyard and usually 2 storey with basement. Burnaby is one of the interesting ‘city’ within greater vancouver. It is designed around TOD for the skyline stations. The apartments and shopping malls around stations are skyscrapers with high density. But when you walk about 1km away there will be suburban parks and houses. This give people a lot of choice. I went to Vancouver way back in the 1980s – 1986 perhaps? and just happened to coincide my trip with the opening of the first Skytrain service in Vancouver. It was an amazing eye-opener for a kid from small town NZ (at about the time that the Auckland rail service was being run into the ground and destroyed), but it was just as much an eye-opener for the residents in BC as well. What I recall is that there was some distrust over the driverless aspect of the trains – whether it would be safe or not – and to prove it, someone apparently dropped a log on the tracks in front of the train (not sure if that was an official test or just a local). Train obviously passed with flying colours – didn’t crash, came safely to a stop etc, and the people of Vancouver have loved the service and expanded it considerably since. Sad to hear if the system is not being kept up to date. What was also noticeable then, and it is curious that it is not mentioned in the article, is that Canada – and especially Vancouver – embraced the Chinese people fleeing from Hong Kong. NZ set up very stern controls to keep the HK Chinese out (along with all their money), while BC welcomed them in their thousands (along with considerable ex-HK wealth), causing a massive property boom. Looking at that picture heading this post, I don’t think a single one of those tall buildings was there at the time. It would be interesting to know if the Government over there had a blanket welcome to migrants, or if they stipulated that money had to be put into new businesses or new buildings – it certainly looks like the later. The Hong Kong people brings their best TOD city planning ideas and vancouver adopt them as a result. I went to Vancouver once was it when they were hosting the expo was the original sky train built for that sort of jogs my memory a bit.It would have being in the 1980’s. Pedestrian crossings sound like they welcome walking! Wow. That makes a big change from New Zealand where people walk despite the lack of central funding, basic standards not met, and no priority in road space/time. 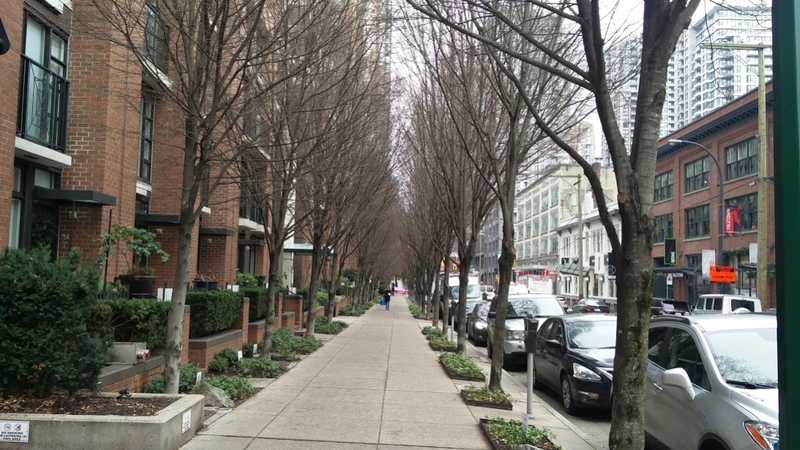 The street trees look great too – were the footpaths particularly wide? The other aspect to being a pedestrian in Western Canada (east is different) is that pedestrians almost all follow the rules as well (eg waiting at lights when they have a red light rather than run across the road to save a minute). For some reason when both sides follow the rules things work well. Unfortunately New Zealanders are bad at being considerate drivers and pedestrians. I don’t know if it is even possible to fix that sort of ingrained behaviour/culture, as both need to do a lot better to make things work. Traffic light cycles: in central Melbourne (Hoddle grid) most intersections have 80 to 90-second, two-part cycles. Left-turning traffic waits for pedestrians, right-turning traffic waits till the road is clear (or does hook turns). Pedestrians have 20 seconds of green man + 20 seconds of flashing red man in each 90 seconds. Compared with a four-part cycle that might give you 10 seconds of green man in 2 1/2 minutes, the difference in pedestrian amenity is very noticeable.